Stir up some Halloween fun with this 3-ingredient CHEEZ WHIZ dip. Serve it with veggie dippers for a quick appetizer for kids of all ages. 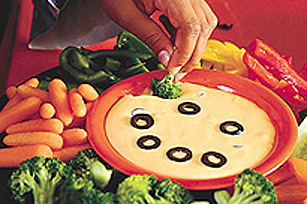 Mix together 1 cup Cheez Whiz Spread, 1/2 cup Miracle Whip Original Spread and 1/4 cup sliced black olives. Spoon into small bowl and place extra black olive slices on top to create scary face. Serve with vegetables.